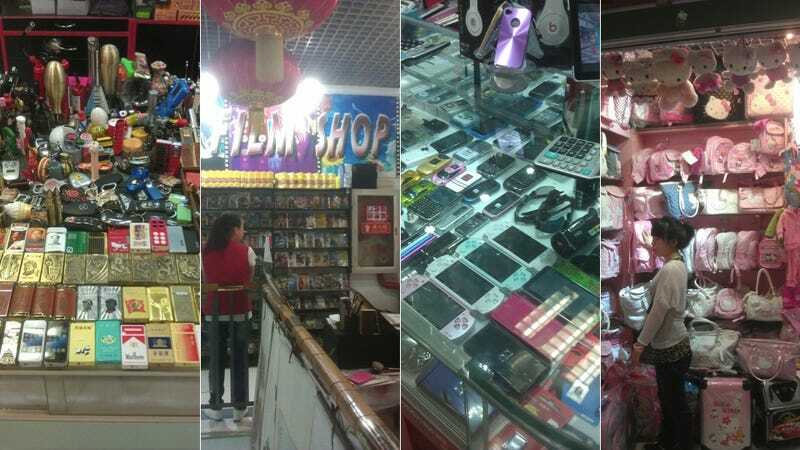 There are countless markets in China that sell un-branded merchandise that appears to be blatant knock-offs, but there are certain places in every major city in China that sell knock-off and counterfeit goods right in the open. Located in big cities such as Beijing, Shanghai, and Guangzhou, these markets are huge tourist traps. They sell everything from fake designer nail polish to bootleg video games. Unlike the technology gray markets, these shopping centers are tourist destinations. Everyday there are at least one or two coach buses parked out front, bringing domestic and international tourists alike to these places. How these centers are still operational today is still a legal mystery. The photos above were taken today at the Silk Street Market (秀水街) in Beijing. The Silk Street Market has been the focus of many copyright infringement lawsuits in China over the last decade. Back in 2009, the Silk Street Market and many others like it were hit with copyright infringement lawsuits which led to the closing of 29 stalls. Despite newer and stronger intellectual property laws in China and stronger law enforcement, places like the Silk Market still persist. Walking through the market today, I saw some products that were blatantly counterfeited, I was also approached by a man in the basement offering to sell me authentic Coach and LV bags for cheap. Moving up to the fifth floor where they sold electronics, I approached a booth selling Beats by Dre headphones. I asked the lady if her headphones were real, she said they were. I told her I didn't believe her, and she started showing me how the headphones were legit compared to what her neighbor was selling. When I asked her for the price, she told me 500 RMB, or $80 US. Real Beats costs about 3000 RMB ($475 US) and they don't come in Neon Pink. Jack Chang, Chairman of the Quality Brands Protection Committee in China, said in an interview in 2008 with China IP Magazine, the reason why the Silk Market persists, is because of the customers. "Vendors earned 100 Yuan yesterday for selling fake products, but earned nothing today for not selling, therefore their interests are impaired at the beginning of IP protection," he said. "Interest is the root cause for the survival of counterfeit products. Economic incentive leads to the combination of supply and marketing, the buyer is the mother of the seller. From the standpoint of the market's managers, and high rents for stalls induce vendors into selling counterfeit products to make ends meet. "Therefore all these counterfeit deals are rooted in economic benefits." It seems like there is indeed a demand for knock-off goods, because business at the Silk Street seems to continue on as normal—legal troubles and all.